The Taryn Collection offers a touch of luxury, style, comfort, and durability to your outdoor patio area. 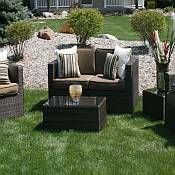 The set is made of all weather brown wicker over rust-resistant, heavy-duty all welded frames. The sectional pieces of this set make it very versatile and easy to fit into your favorite spot. The full woven coffee table has a protective glass top. The Sunbrella cushions are included in the set. This patio furniture collection is perfect for lounging outside on a nice day or enjoying the stars on a beautiful night. The Taryn Collection is a wonderful set if you are seeking a luxurious, yet durable and versatile, furniture set. This collection coordinates with the All Weather Wicker Storage Trunk (in brown wicker) shown below.